“Heather” is a blend of wool, cultivated silk and nylon. It is hand dyed in small batches in New York. This yarn is very soft and long wearing. The silk content makes for a very luxurious sock or garment. It comes in several vibrant colors-ways. 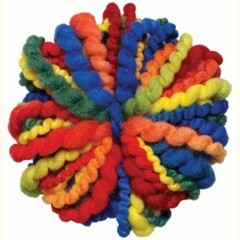 We carry a lot of hand dyed yarns, and feel that Schaefer yarns are a step above the rest. Their yarns are breathtaking! One skein makes an average sized pair of women’s socks. Please note: the circular color-way pictured is of a random Schaefer yarn in the listed color, not Heather.